Pink Gaura is an absolute flight of fancy. The photo above shows Pink Gaura in our three-inch pots blooming in the greenhouse over winter. The leaves with their irregular red blotching are as beautiful as the flowers. Pink Gaura dies back in the winter and should be cut back to the ground. It will return in early spring and continue growing and blooming until the following frost. The flower wands start out only inches from the ground but can be 3 or 4 feet long by the end of summer. Each year the crown of the plant gets a little larger and produces more stems. 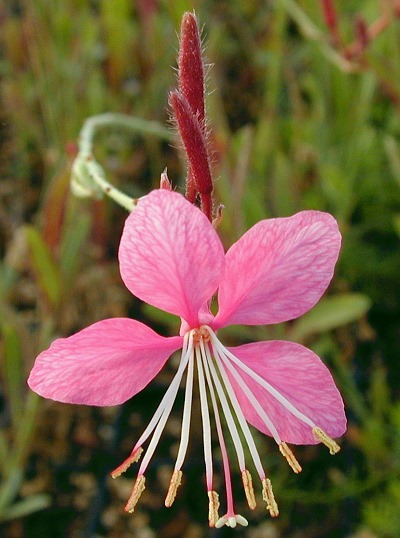 Pink Gaura plants often put out a bicolor show of peppermint mottled flowers. Occasionally an all white flowered wand shoots up to mix with the pink ones. The only predator we have seen go after Gaura is the gopher. Deer and rabbits seem to leave it alone. It is an important beneficial insect and bee plant and butterflies love it. Pink Gaura makes a great addition to our Wildlife Herb Garden Six Pack and would blend nicely into our English Cottage Herb Garden Six Pack. This plant is often available in plug trays. These trays hold 128 of all the same plant. They are a great low cost way to fill a lot of space. Each cell is 3/4 of inch by 3/4 of an inch. 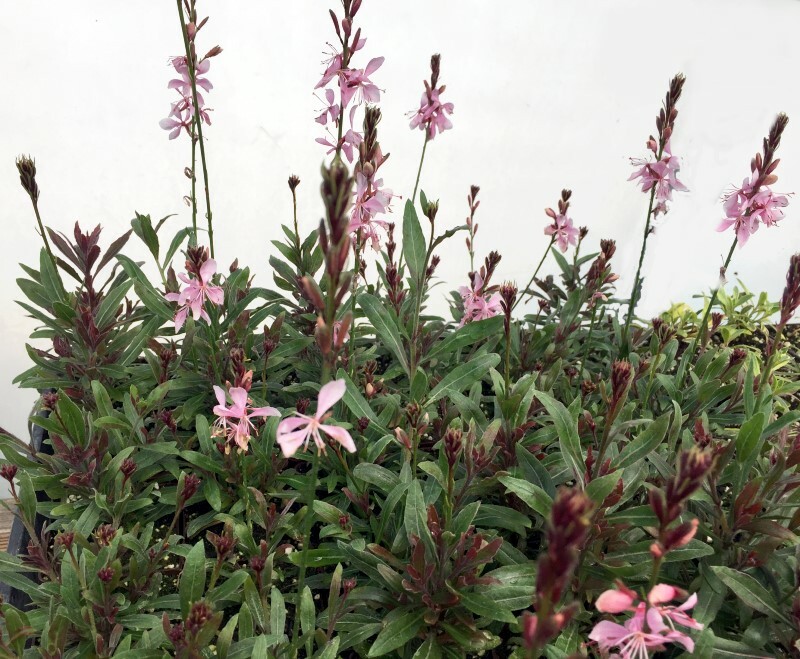 Check here to see if Pink Gaura Plug Trays are available.